The 34.05 metre motor yacht Caprice I, listed for sale by Abberley Luxury Yachts, has been sold in an in-house deal with Denis Patrakov representing both buyer and seller. Launched in 1998 by Italmarine as hull number one in the yard’s Barracuda 34 series, she was built from a composite hull and superstructure and has been privately used ever since. Her naval architecture was developed by Giovanni Arrabito, while Evan K Marshall redesigned her interior décor as part of her 2016 refit. Accommodation is for eight guests split between four cabins, while her crew quarters allow for a staff of up to five people. Her interiors are described by the broker as “spacious, elegant and minimalist” while a wide range of entertainment systems caters for all needs. The main saloon is split into a relaxed lounging space with plush sofas and armchairs, and a more formal dining space with room for eight to enjoy a meal around a glass-topped table. 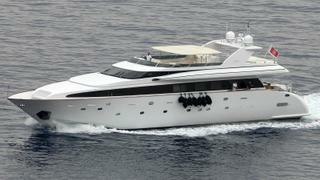 Key features include her sprawling sundeck which features extensive bench seating back aft. Moving forward of the arch and two further curved sofas offer plenty of seating options under a retractable Bimini. Power comes from a pair of 1,875hp Deutz-MWM TBD6 16V diesel engines that propel her to a fast cruising speed of 21 knots, topping out at 24 knots. When trimmed back to her economical speed of 12 knots, she boasts a maximum cruising range of 1,250 nautical miles, drawing on a total fuel capacity of 25,000 litres. Caprice I was asking €1,500,000.